Now, here's an idea that will give me nightmares for years: Guillermo Del Toro is going to direct the stop-motion feature adaptation of Roald Dahl's fantastic novel The Witches, where a small boy gets trapped in a hotel while the annual convention of witches is taking place. The brilliant Alfonso Cuaron (Children of Men), was the original front runner for the director spot. But Cuaron told Empire Magazine he's stepped up to produce the feature, and Del Toro is now the director. Apparently the two started chatting about adapting about Dahl's story "Uncle Oswald" when they got on the subject of The Witches. "The pair were discussing the potential of adapting the much naughtier Dahl story Uncle Oswald, when the conversation turned to The Witches. Cuaron told us: 'Guillermo wrote this amazing screenplay really quickly." Well, of course he did. I can't imagine that Del Toro has even one foot in the realm of reality, which is why he can probably churn this stuff out so fast, and so well. While I'm nervous that GDT is now currently directing everything I have some sort of personal interest in, I'm not terribly nervous. It's going to be stop motion, which means it will take 10 years to make anyways if they're going to create a world of witchy creatures to stand up to the likes of Del Toro's mind. Plus, his initials are practically GTD. 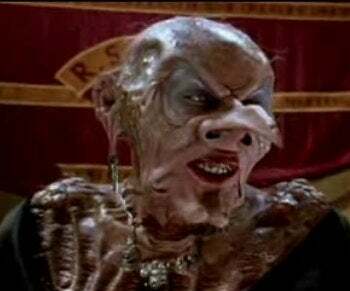 I'm glad they're not going down the live-action route out of respect to Nicolas Roeg's amazing live adaptation, but I have a terrible feeling these bald scratchy scalp witches will also leave me shaking under the dining room table.